Jeannie E. Roberts has authored six books, including Rhyme the Roost! A Collection of Poems and Paintings for Children (Daffydowndilly Press, an imprint of Kelsay Books, 2019), The Wingspan of Things, a poetry chapbook (Dancing Girl Press, 2017), Romp and Ceremony, a full-length poetry collection (Finishing Line Press, 2017), Beyond Bulrush, a full-length poetry collection (Lit Fest Press, 2015), Nature of it All, a poetry chapbook (Finishing Line Press, 2013), and Let's Make Faces!, her first illustrated children's book (author-published, 2009). Her poems appear in online literary journals, magazines, and print anthologies. Her public readings include Barnes & Noble, L.E. Phillips Memorial Public Library, Weidner Center for the Performing Arts, and other venues. She is Poetry Editor of the online literary magazine Halfway Down the Stairs and a member of the Wisconsin Fellowship of Poets. In 2007, her poem, "La Luz," won first place in the Green Bay Symphony Orchestra’s statewide poetry contest. The Green Bay Symphony Orchestra’s Music Alive Composer-In-Residence, Daniel Kellogg, set her poem to music via an orchestral score with choir. In 2008, this new work was performed by the Green Bay Symphony Orchestra with the Dudley Birder Chorale. RHYME THE ROOST! A COLLECTION OF POEMS AND PAINTINGS FOR CHILDREN, 2019, $14.00 U.S. THE WINGSPAN OF THINGS, 2017, $7.00 U.S.
ROMP AND CEREMONY, 2017, $19.99 U.S. BEYOND BULRUSH, 2015, $16.00 U.S. 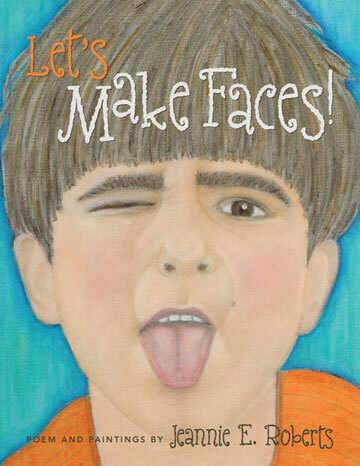 NATURE OF IT ALL, 2013, $14.00 U.S.
LET'S MAKE FACES!, 2009, $9.99 U.S.